Fully tested and approved for use with all E-MetroTel UCx server appliances, the optional Call Accounting can pinpoint bottlenecks, highlight suspicious activity, reconcile billing invoices, help formulate migration strategies and control telecom spend. Shadow CMS Call Accounting offers a scalable, centralized design architecture that supports the capture, processing and reporting of communication metrics including mobile, conference, voice mail, call center agent/queue, attendant, etc. It enables allocation of charges to various locations, divisions or departments, cost centers or other corporate levels. Statistics are produced for bandwidth, trunk usage, grade of service, all trunks busy and peak or busy hour analysis. Revolution Web Call Accounting is a browser based call accounting software that monitors incoming and outgoing calls in real time and produces detailed, summary and graphical reports. Alarms and reports can be scheduled for emergency 911 notification, toll fraud or misuse reporting. A built-in contacts database can be used to quickly identify all calls made to / from a particular contact and tagged as personal or business related. Cloud Call Accounting is a secure, cloud based service for remote polling, authorization code billing, charge-back, network planning, traffic analysis, carrier/service comparisons, cradle-to-grave reporting, mobile tracking, email, voice mail, call center, auto attendant and more. It offers a dynamic set of cloud based reports that can improve network performance, cut misuse and abuse, improve productivity and increase your bottom line. 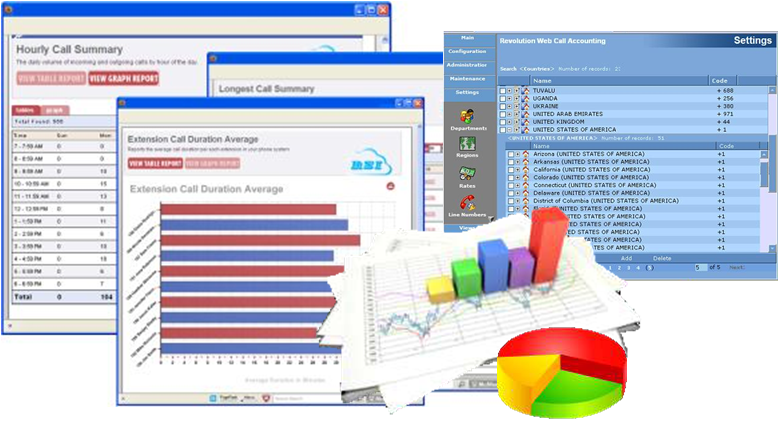 All accounting software that monitors incoming and outgoing calls in real time and produces detailed, summary and graphical reports. Alarms and reports can be scheduled for emergency 911 notification, toll fraud or misuse reporting. A built-in contacts database can be used to quickly identify all calls made to / from a particular contact and tagged as personal or business related.